Coinciding with Bhutan’s ‘Climate Summit for a Living Himalayas’, the International Centre for Integrated Mountain Development (ICIMOD) and the Ministry of Agriculture and Forests, Royal Government of Bhutan, will hold a series of events to draw the attention of policy makers, government agencies, development agencies, community workers, youth and children to the potential for using remote sensing and Earth observation technologies to better understand and address issues of climate change. Under the heading ‘Connecting from Space to Village’, the events to be held in Thimphu, Bhutan from 14 to 19 November 2011 aim to bring the benefits of modern technologies to mountain communities in the Himalayan region. The international symposium ‘Connecting from Space to Village: Enabling Climate Policy and Actions in the Himalayas’ from 17 to 18 November 2011 will provide a regional platform for sharing experiences of Earth observation applications in line with the Bhutan Summit themes (ensuring food security and livelihoods; securing the natural fresh water systems of the himalayas; securing biodiversity and ensuring its sustainable use; and ensuring energy security and enhancing alternative technologies). The symposium will demonstrate the use of Earth observation and geospatial tools and technologies for enhanced scientific knowledge and understanding of climate change. It will bring together leading personalities, summit delegates, government officials, and stakeholders from the region and beyond. 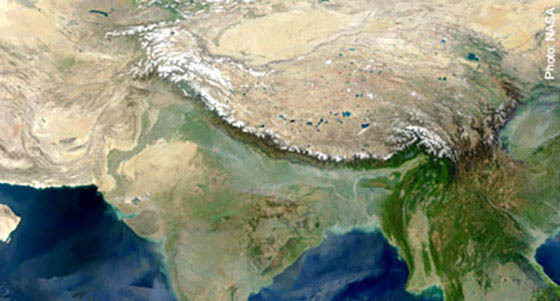 A special week-long event dedicated to youth, ‘Earth Observation: Empowering Youth for Climate Actions in the Himalayas’ will take place from 14 to 19 November 2011 with 40 participants from Bangladesh, Bhutan, India, and Nepal. The event aims to raise awareness among young people about climate change and appropriate actions they can take in their local communities. In addition, a special interactive event is planned for Thimphu schoolchildren on 16 November, which is also Geographic Information Systems (GIS) Day. On this occasion, ICIMOD will also launch its ‘Herbal Gardens in Schools’ initiative in Bhutan. Finally, an exhibition of posters, demonstrations, and online applications from 17 to 19 November will showcase key Earth observation applications addressing climate change in the eastern Himalayan region, with a particular focus on Bhutan. The showcase will be open to public on 19 November. “Earth observation such as satellite imagery and forecast models together with in situ data and other knowledge is gaining increasing importance in a wide spectrum of strategic programmes and proving its direct relevance to mountain development policies and practices” observes ICIMOD Director General, Dr Andreas Schild. “The events aim to bring the benefits of satellite-based technologies to mountain communities and will feature practical applications ranging from understanding melting of glaciers, forest cover changes, monitoring and detecting forest fire, emergency response for earthquake disaster, monitoring agriculture and food security, mapping happiness index, participatory three-dimensional modelling of Bumthang, and many more” adds Basanta Shrestha, Head of ICIMOD’s Mountain Environmental Natural Resources Information Systems (MENRIS). The events have been put together under the SERVIR Himalaya initiative supported by the United States Agency for International Development (USAID) and the National Aeronautics and Space Administration (NASA). ICIMOD is developing various Earth observation applications largely within the framework of this initiative under the five broad themes of cryosphere and water; ecosystems and biodiversity; disaster risk preparedness and emergency responses; transboundary air pollution and black carbon; and agriculture and food security.